Republicans and Democrats like to claim that they are on opposite sides of important issues. Of course, depending on which way the wind blows, they sometimes change sides, like over support for free trade and federal deficits. Tragically, however, there is no division when it comes to militarism. For example, the federal budget for fiscal year 2018 (which ends on September 30, 2018), included more money for the military than even President Trump requested. Trump had asked for a military budget of $603 billion, a sizeable $25 billion increase over fiscal year 2017 levels; Congress approved $629 billion. Trump had also asked for $65 billion to finance current war fighting, a bump of $5 billion; Congress approved $71 billion. The National Defense Authorization Act of 2018, which set the target budget for the Department of Defense at this high level, was approved by the Senate in a September 2017 vote of 89-9. In a rare act of bipartisanship on Capitol Hill, the Senate passed a $700 billion defense policy bill . . . that sets forth a muscular vision of America as a global power, with a Pentagon budget that far exceeds what President Trump has asked for. That Act also called for a further increase in military spending of $16 billion for fiscal year 2019 (which begins October 1, 2018). 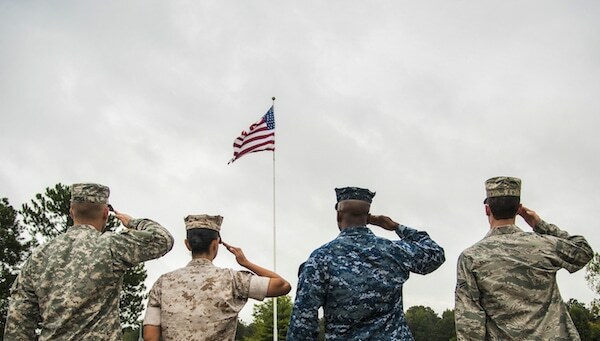 And, in June 2018, the Senate voted 85 to 10 to authorize that increase, boosting the Defense Department’s fiscal year 2019 total to $716 billion. This bipartisan embrace of militarism comes at enormous cost for working people. This cost includes cuts in funding for public housing, health care and education; the rebuilding of our infrastructure; basic research and development; and efforts to mitigate climate change. It also includes the militarization of our police, since the military happily transfers its excess or outdated equipment to willing local police departments. And it also includes a belligerent foreign policy. A case in point: Congress has made clear its opposition to the Trump administration decision to meet with North Korean leader Kim Jong-un and halt war games directed against North Korea, apparently preferring the possibility of a new Korean War. Congress is also trying to pass a law that will restrict the ability of the President to reduce the number of U.S. troops stationed in South Korea. In brief, the U.S. military industrial complex, including the bipartisan consensus which helps to promote militarism’s popular legitimacy, is one of the most important and powerful foes we must overcome if we are to seriously tackle our ever-growing social, economic, and ecological problems. only 11 other countries have bases in foreign countries, some 70 altogether. Russia has an estimated 26 to 40 in nine countries, mostly former Soviet Republics, as well as in Syria and Vietnam; the UK, France, and Turkey have four to 10 bases each; and an estimated one to three foreign bases are occupied by India, China, Japan, South Korea, Germany, Italy, and the Netherlands. U.S. special forces are deployed in even more countries. According to Nick Turse, as of 2015, these forces were operating in 135 countries, an 80 percent increase over the previous five years. That’s roughly 70 percent of the countries on the planet. Every day, in fact, America’s most elite troops are carrying out missions in 80 to 90 nations practicing night raids or sometimes conducting them for real, engaging in sniper training or sometimes actually gunning down enemies from afar. This widespread geographic deployment represents not only an aggressive projection of U.S. elite interests, it also provides a convenient rationale for those that want to keep the money flowing. The military, and those that support its funding, always complain that the military needs more funds to carry out its mission. Of course, the additional funds enable the military to expand the reach of its operations, thereby justifying another demand for yet more money. It is no simple matter to estimate of how much we spend on military related activities. The base military budget is the starting point. It represents the amount of the discretionary federal budget that is allocated to the Department of Defense. Then there is the overseas contingency operations fund, which is a separate pool of money sitting outside any budgetary restrictions, that the military receives yearly from the Congress to cover the costs of its ongoing warfare. It is the combination of the two that most analysts cite when talking about the size of the military budget. Using this combined measure, the Stockholm International Peace Research Institute finds that the United States spends more on its military than the next seven largest military spenders combined, which are China, Russia, Saudi Arabia, India, France, the UK, and Japan. The biggest in recent American history since at least the 1970s, adjusting for inflation. The Project on Government Oversight (POGO) tabulated all “defense-related spending” for both 2017 and 2018, and it hit nearly $1.1 trillion for each of the two years. The “defense-related” part is important because the annual National Defense Authorization Act, a.k.a. the defense budget, doesn’t fully account for all the various forms of national security spending that gets peppered around a half-dozen agencies. You might think that the most powerful weapons in the U.S. arsenal—nuclear warheads—would be paid for out of the Pentagon budget. And you would, of course, be wrong. The cost of researching, developing, maintaining, and “modernizing” the American arsenal of 6,800 nuclear warheads falls to an obscure agency located inside the Department of Energy, the National Nuclear Security Administration, or NNSA. It also works on naval nuclear reactors, pays for the environmental cleanup of nuclear weapons facilities, and funds the nation’s three nuclear weapons laboratories, at a total annual cost of more than $20 billion per year. Hartung’s grand total, which includes, among other things, the costs of Homeland Security, foreign military aid, intelligence services, the Veterans Administration, and the interest on the debt generated by past spending on the military, is $1.09 trillion, roughly the same as the POGO total cited above. In short, our political leaders are far from forthcoming about the true size of our military spending. The Defense Department’s Inspector General, in a June  report, said the Army made $2.8 trillion in wrongful adjustments to accounting entries in one quarter alone in 2015, and $6.5 trillion for the year. Yet the Army lacked receipts and invoices to support those numbers or simply made them up. As a result, the Army’s financial statements for 2015 were “materially misstated,” the report concluded. The “forced” adjustments rendered the statements useless because “DoD and Army managers could not rely on the data in their accounting systems when making management and resource decisions.” . . . The report affirms a 2013 Reuters series revealing how the Defense Department falsified accounting on a large scale as it scrambled to close its books. As a result, there has been no way to know how the Defense Department–far and away the biggest chunk of Congress’ annual budget–spends the public’s money. “Where is the money going? Nobody knows,” said Franklin Spinney, a retired military analyst for the Pentagon and critic of Defense Department planning. . . . Almost half of the U.S. military budget goes to private military contractors. These military contracts are the lifeblood for many of the largest corporations in America. Lockheed Martin and Boeing rank one and two on the list of companies that get the most money from the government. In 2017 Lockheed Martin reported $51 billion in sales, with $35.2 billion coming from the government. Boeing got $26.5 billion. The next three in line are Raytheon, General Dynamics, and Northrop Grumman. These top five firms captured some $100 billion in Pentagon contracts in 2016. The Pentagon buys more than just weapons. Health care companies like Humana ($3.6 billion), United Health Group ($2.9 billion), and Health Net ($2.6 billion) cash in as well, and they’re joined by, among others, pharmaceutical companies like McKesson ($2.7 billion) and universities deeply involved in military-industrial complex research like MIT ($1 billion) and Johns Hopkins ($902 million). Not surprisingly, given how lucrative these contracts are, private contractors work hard to ensure the generosity of Congress. In 2017, for example, 208 defense companies spent almost $100 million to deploy 728 reported lobbyists. Lobbying is made far easier by the fact that more than 80 percent of top Pentagon officials have worked for the defense industry at some point in their careers, and many will go back to work in the defense industry. Then there are arms sales to foreign governments. Lawrence Wittner cites a study by the Stockholm International Peace Research Institute that found that sales of weapons and military services by the world’s largest 100 corporate military suppliers totaled $375 billion in 2016. U.S. corporations increased their share of that total to almost 58 percent, supplying weapons to at least 100 nations around the world. From the president on his trips abroad to visit allied world leaders to the secretaries of state and defense to the staffs of U.S. embassies, American officials regularly act as salespeople for the arms firms. The federal budget is divided into three categories: mandatory spending (primarily social security and medicare), discretionary spending, and interest on the debt. Two trends in discretionary spending, the component of the budget set each year at the discretion of Congress, offer a window on how militarism is squeezing out funding for programs that serve majority needs. 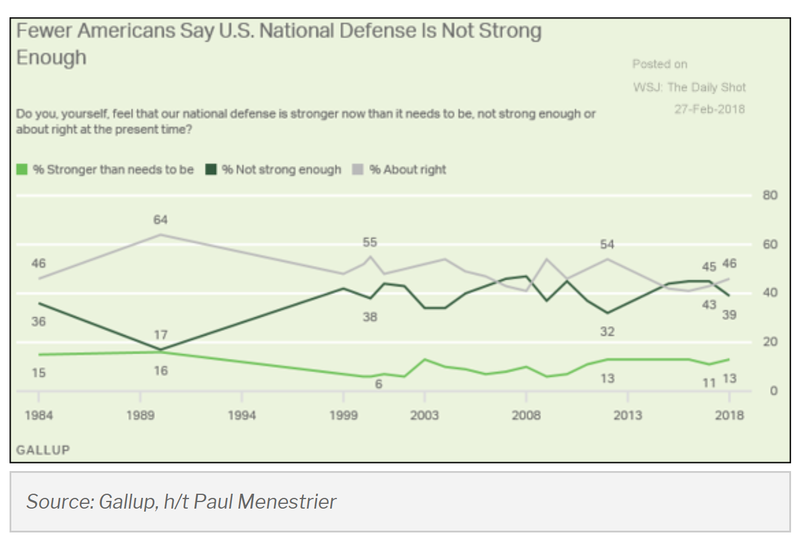 The first noteworthy trend is the growing Congressional support for defense (base military budget) over non-defense programs. In 2001, the majority of discretionary funds went to non-defense programs. 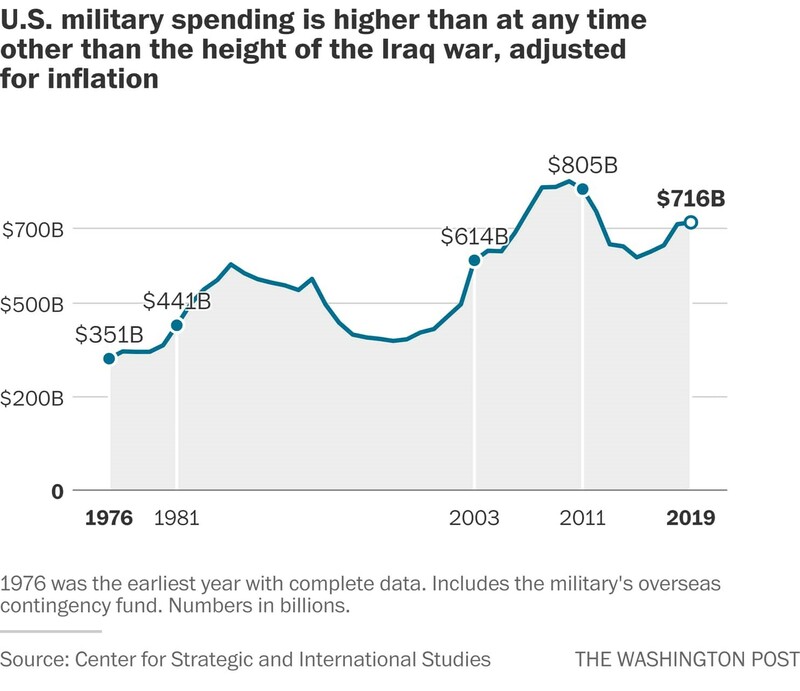 However, that soon changed, as we see in the chart below, thanks to the “war on terror.” In the decade following September 11, 2001, military spending increased by 50 percent, while spending on every other government program increased by only 13.5 percent. 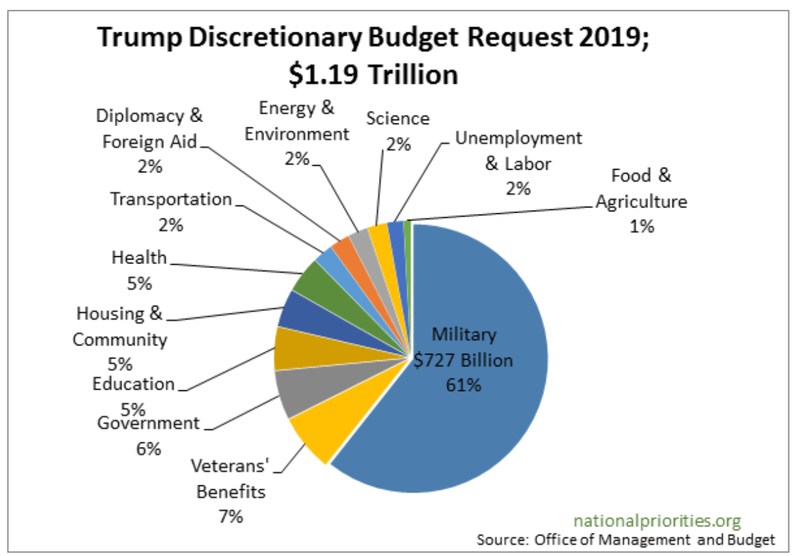 In the 2018 federal budget, 54 percent of discretionary funds are allocated to the military (narrowly defined), $700 billion to the military and $591 billion to non-military programs. The chart below shows President Trump’s discretionary budgetary request for fiscal year 2019. As we can see, the share of funds for the military would rise to 61 percent of the total. 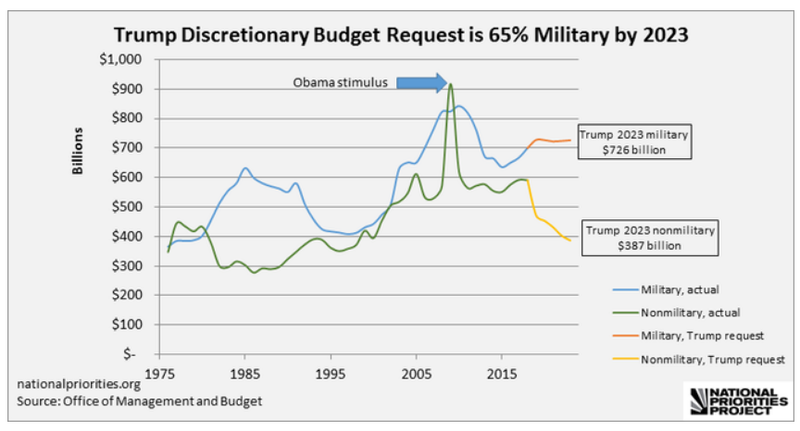 According to the National Priorities Project, “President Trump’s proposals for future spending, if accepted by Congress, would ensure that, by 2023, the proportion of military spending [in the discretionary budget] would soar to 65 percent.” Of course, militarism’s actual share is much greater, since the military is being defined quite narrowly. For example, Veterans’ Benefits is included in the non-defense category. The second revealing trend is the decline in non-defense discretionary spending relative to GDP. Thus, not only is the military base budget growing more rapidly than the budget for nondefense programs, spending on discretionary non-defense programs is not even keeping up with the growth in the economy. This trend translates into a declining public capacity to support research and development and infrastructure modernization, as well as meet growing needs for housing, education, health and safety, disaster response. . .the list is long. The Budget Control Act of 2011 (BCA) capped both categories of discretionary spending as part of a broader effort to reduce future deficits. When Congress failed to reach a bipartisan agreement on taxes and other categories of federal spending, the BCA automatically triggered an even deeper, across-the-board cut to discretionary spending known as sequestration. While the sequester has been lifted several times since it first took effect, discretionary spending consistently remained far below the original BCA caps. That trend ended with the Bipartisan Budget Act of 2018 (BBA). This budget deal not only lifted discretionary spending above sequester levels–it also went above and beyond the original BCA caps for two years. Nevertheless, projected domestic discretionary spending for Fiscal Year 2019 is significantly below the historical average as a percentage of gross domestic product. 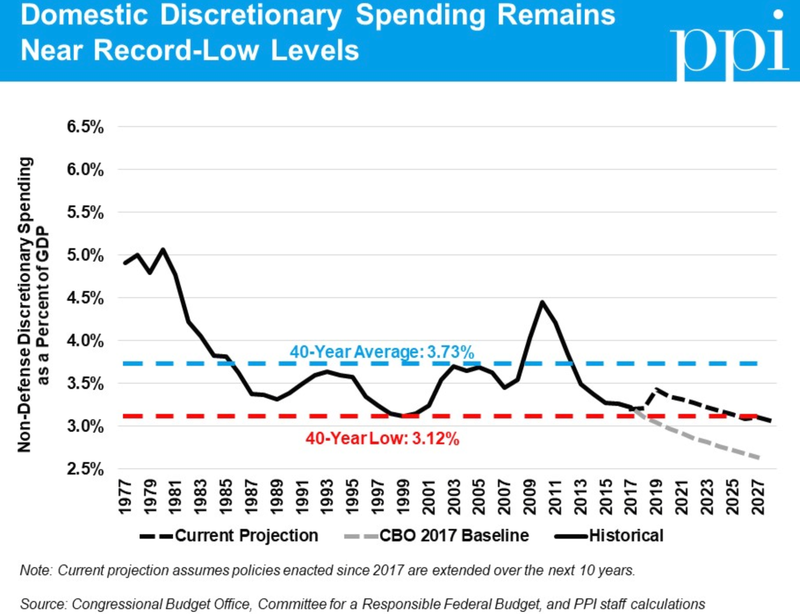 Moreover, even if policymakers extended these policy changes beyond the two years covered by the BBA, we project that domestic discretionary spending could fall to just 3 percent of GDP within the next decade–the lowest level in modern history [see dashed black line in chart below]. The story is similar for defense spending. Thanks to the pressure put on by the sequester, defense discretionary spending fell to just under 3.1 percent of GDP in FY2017. Under the BBA, defense spending would increase to 3.4 percent of GDP in FY2019 before falling again [see dashed black line in following chart]. Unlike domestic discretionary spending, however, defense would remain above the all-time low it reached before the 2001 terrorist attacks throughout the next decade. 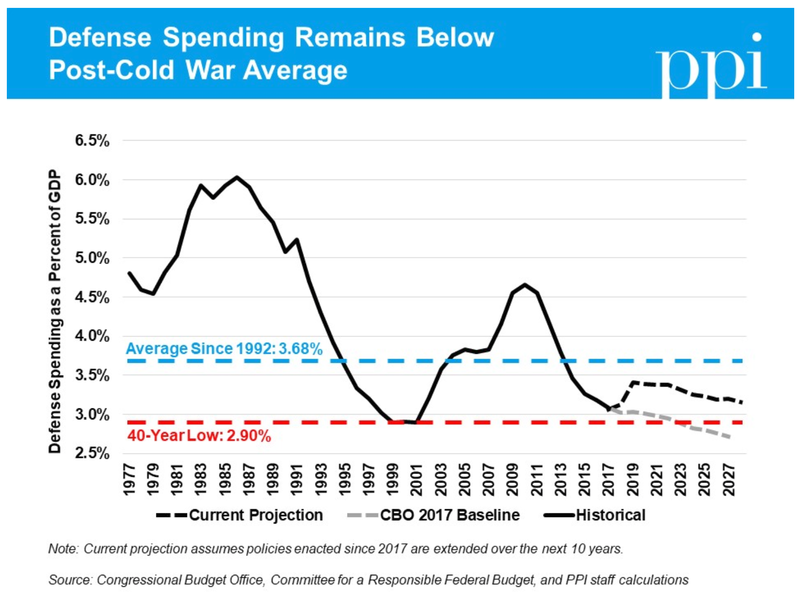 In sum, Congress appears determined to squeeze non-defense programs, increasingly privileging defense over non-defense spending in the discretionary budget and allowing non-defense spending as a share of GDP to fall to record lows. The ratio of discretionary defense spending relative to GDP appears to be stabilizing, although at levels below its long-term average. However, discretionary defense spending refers only to the base budget of the Department of Defense and as such is a seriously understated measure of the costs of U.S. militarism. Including the growing costs of Homeland Security, foreign military aid, intelligence services, the Veterans Administration, the interest on the debt generated by past spending on the military, and the overseas contingency operations fund, would result in a far different picture, one that would leave no doubt about the government’s bipartisan commitment to militarism. Fighting militarism is not easy. Powerful political and business forces have made great strides in converting the United States into a society that celebrates violence, guns, and the military. The chart below highlights one measure of this success. Sadly, 39 percent of Americans polled support increasing our national defense while 46 percent think it is just about right. Only 13 percent think it is stronger than it needs to be. Polls, of course, just reveal individual responses at a moment in time to questions that, in isolation, often provide respondents with no meaningful context or alternatives and thus reveal little about people’s true thoughts. At the same time, results like this show just how important it is for us to work to create space for community conversations that are informed by accurate information on the extent and aims of U.S. militarism and its enormous political, social, economic, and ecological costs for the great majority of working people.